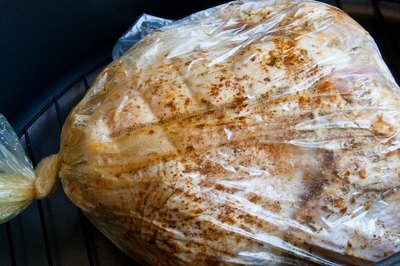 Cooking turkey in an oven bag is a smart way to go as it is a self-basting method that allows for juicy meat and a no-hassle cleanup. The key when making turkey is knowing how long to cook it to guarantee that there is no risk of food-borne illnesses. The main thing to consider when getting ready to cook a turkey is if it is completely thawed--which is a nonissue if you're cooking a fresh turkey. If you are going to cook a turkey, that has been previously frozen check that it is completely thawed. By following the instructions on the turkey's label, you'll make sure that it is ready for cooking and will be prepared in the appropriate amount of time. Turkeys that are not thawed properly increase the chance that you will end up with an undercooked bird that can carry food-borne illnesses such as salmonella. To prepare the turkey once it is thawed, remove the giblets and the neck from inside the cavity. Wash the entire turkey with warm water and then pat it dry with a paper towel. If you are going to stuff the turkey (which isn't recommended by many sources due to the increased cooking times and increased risk factors), then now is the time to do it. Make sure to season the turkey now, both on the skin and inside the cavity. 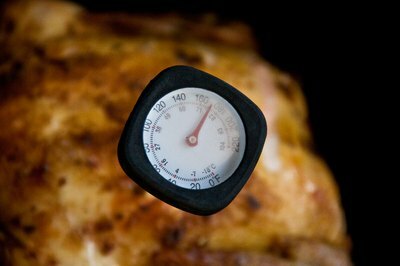 Preheat your oven to 350 degrees, which is the recommended temperature for cooking all poultry. You'll want to make sure that you have the extra large cooking bags as well, as they are the appropriate size for a turkey. Most bags ask for a tablespoon of flour to be placed inside before the turkey is inserted, as this will help mix the fats and the juices and prevent the bag from popping while in the oven. Place the turkey, breast side up, in the bag and then place the bagged bird into a roasting pan that is at least 2 inches deep. Make sure to seal the bag. The rule of thumb is to cook poultry for 15 to 17 minutes per pound. Add 30 minutes extra to any cooking time if you're stuffing the turkey. The best way to check if a turkey is done cooking is to use a meat thermometer. These are invaluable when checking to see if the turkey has reached a temperature of 165 degrees, which is considered completely cooked. Most chefs, like those at Global Gourmet, prefer to get the turkey meat up to about 185 degrees. Make sure to check that the stuffing is at the same temperature, which is high enough to prevent food-borne illnesses. Once the turkey has reached the appropriate temperature, let it sit for 15 to 20 minutes to allow the juice to saturate into the meat, allowing for a succulent turkey. What Is the Cooking Time for Turkey Crown? How Long Does it Take to Cook a Turkey in a Convection Oven?